During September 2011 a cover which was carried to the moon by the crew of Apollo 15 was auctioned by RR Auction and brought for $7139 + 20% buyers premium. Note the USS Okinawa postmark. Prior to the flight of Apollo 15, a German stamp dealer cut a deal with the crew to carry 100 covers to the moon in return for $7,000 each, on the condition that they not be sold until after the end of the Apollo program. The crew carried his covers, along with 300 of their own. 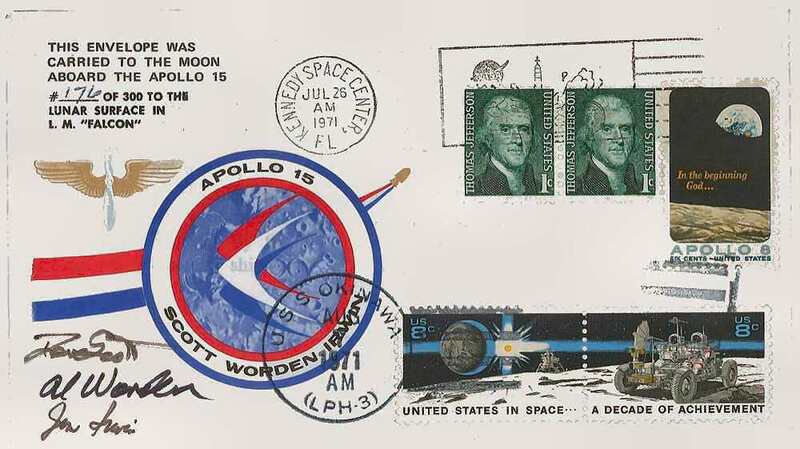 Despite the agreement not to sell the items, the stamp dealer immediately began offering them to interested parties…leading to a Congressional investigation and a decision by NASA to suspend Scott, Worden, and Irwin from flight duty. The agency also confiscated the items owned by the Apollo 15 crewmen. In 1983, after the US Post Office announced plans to fly 260,000 covers onboard a Space Shuttle, Worden sued the government for return of the Apollo 15 cachets. The trail of the offered cover is a piece of space collectible legend, with the provenance that tells the tale in great detail! RRAuction COA.